Logitech makes amazing computer peripherals for all sorts of ocassions. Whether you’re a gamer or just a normal computer user, you can appreciate their products in both their design and even in their price range. The Logitech G110 Gaming Keyboard allows for you to change the color of the LED backlighting. That’s right — custom LED backlighting. This means that if you’re the type of person who likes to match their keyboard lights with their computer case / fans LED lighting, then it’s very much doable. You can choose red, blue, and purple, as well as alter the intensity or brightness of the color. Something interesting that the G110 sports is a headset-ready USB audio port. This can be used with headphones, microphones, or even headsets — so if you are a gamer who likes to talk to his fellow players online, or someone who enjoys using Skype for conferences and so forth, then this feature is very convenient and allows you to not have to plug the aforementioned devices into your computer. This is not only faster, but good for cable management too. This keyboard also has a USB Hub for those who wish to charge their iPods, plugin USB drives / flash drives, etc. The keyboard functions as you would expect a Logitech keyboard to. The G110’s palmrest makes typing feel nice as your fingers press the keys. The keys have good a good grip and do not feel cheap at all. The volume scroller (by the number pad) is fantastic and easy to use. This makes turning your audio up or down a fast and hassle-free process. Logitech makes pretty solid drivers and software for their peripherals and that is the case here. Configuring all the extra keys (G-Keys / Macro keys) is a simple process and has non-gaming advantages as well when configured for software such as Excel, PowerPoint, etc. It can even be handy with graphical software such as Adobe Photoshop or Illustrator. Of course, with games this baby really shines. The software can scan your computer to detect many of the games, but you can always manually configure it too. Use the key profiler to make the magic happen! If you ever wished you had a nice, neat set of keys to map commands to for MMORPGS (i.e. World of Warcraft / WoW) or for FPS games (first person shooters like counter strike, Call of Duty, etc), then get ready for a treat. You’ll With 36 possible unique macro combinations, you’ll have plenty of freedom to map keys for just about everything and thus improve your gaming performance. You can make use of the keys for even RTS games. Please note for those who press many keys down at once that this keyboard does have anti-ghosting too. The build quality of the Logitech G110 Gaming Keyboard is good. It isn’t the most solid keyboard we’ve used, but by no means does it feel fragile. The keyboard’s body is made up of matte grey plastic rather than aluminum. One thing to note is that the keyboard itself is pretty light weight (even more so when you detach the palm rest) so if you are a spazzy gamer or key tapper, the keyboard can shift around a lot. Also, the backlighting, though great, does not show consistantly on all keys (it is more intense in some spots than others). It is simply a tad uneven, but not to a fault. 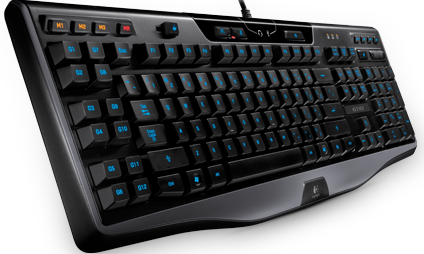 The Logitech Gaming Keyboard G110 is a nice, lower-priced gaming keyboard. It doesn’t have the super build quality of more expensive keyboards, nor is it cheap enough to be a keyboard you’d want to lug around for gaming. It sports some nifty features such as lots of G-keys, multi-colored backlighting, USB hub, etc. — and is a great upgrade for anyone wanting something a little bit extra out of their regular keyboard. The software works well too. There are both reports of success and failure when used with Linux distros / Unix. This entry was posted	on Thursday, August 30th, 2012 at 5:20 PM	and is filed under . You can follow any responses to this entry through the RSS 2.0 feed. You can leave a response, or trackback from your own site.